Turning passion into a profession is a dream for many, but for Natural Evolution Founder and Director Robert Watkins that is exactly what he has done. 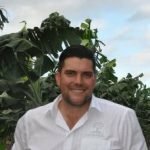 As a second generation farmer Robert has developed a world first processing factory that turns primarily waste green bananas into a high value and supreme nutritional food source. Rob has also received accolades for his other innovations such as Banana Blankey (a fully recyclable banana packaging system) and his other world first a Banana Bunch Harvester. Robs dedication and pioneering of green banana flour is set to change the banana industry where bananas are now being grown strictly for flour processing where ultimate nutrition is priority.